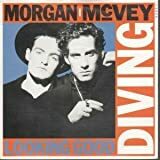 The tune that eventually became Buffalo Stance started out as the b-side of Morgan / McVey’s “Looking Good Diving” which was produced by Stock, Aitken & Waterman. They called in Tim Simenon (Mr Bomb The Bass to me and you) to turn it into the 80s dance classic that it is and the tune blew up. I had absolutely no idea that he’d produced Buffalo (and Manchild for that matter) but listening now it all totally makes sense. Wicked tunes anyway and interesting to hear this proto version.